Bluegrass Pundit: ‘Jihadi John’ unmasked? ‘Jihadi John’ really needs the death penalty . Unfortunately, Brittan banned the death penalty in 1998. 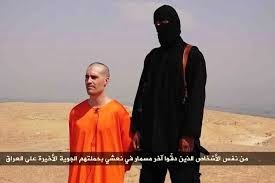 WAPO: ‘Jihadi John’: Islamic State killer is identified as Londoner Mohammed Emwazi LONDON — The world knows him as “Jihadi John,” the masked man with a British accent who has beheaded several hostages held by the Islamic State and who taunts audiences in videos circulated widely online.